An air tight jar made out of ceramic with a wooden lid to store tea. Break away from the monotony of grey steel jars by bringing home this unique coloured jar and add style to your kitchen. We offer our clients with a wide array of Oval Casseroles (1 liter) at competitive prices. Our entire range is sourced from authentic market vendors, who use finest quality ceramic clay to craft these products. Furthermore, these products are used to store and serve various types of food delicacies in homes, hotels and restaurants. 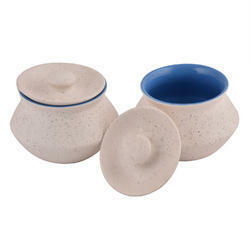 In order to cater to the numerous necessities of the patrons, we have been able to provide a wide range of Ceramic Handi Set. Clay dal Handi set cook dal Biryani rice. We can provide you a wide range of handi sets that are highly appreciated for its multiple designer range as well as perfect finish. Ceramics handi set can keep the cooked food hot for long time. Ceramics handi set manufacturer and exporter offer you its exclusive range of in unique exquisite designs and shapes. Kai Natural Care launched an awesome looking table top Kitchen Grill set which contains- 4 Griller sticks, 2 pieces ceramic containers for keeping necessary sauces and chutneys, Charcoal slider. 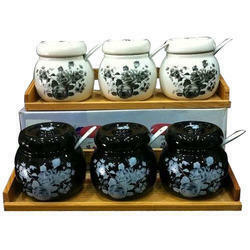 Whether a Vegetarian or a Non Vegetarian this set proves to be an ideal gift as well as a must buy for each home.